The U.S. Air Force's mysterious X-37B space plane will return to Earth this week —possibly as early as Tuesday — after 22 months in orbit on a secret mission. The robotic X-37B space plane, also known as the Orbital Test Vehicle, will land at the Vandenberg Air Force Base in California, where Air Force officials are gearing up for its return. As of today (Oct. 12), the X-37B mini-shuttle has been in orbit since December 2012 and racked up a record-shattering 671 days in space. The X-37B landing could occur on Tuesday (Oct. 14), according to several press reports, including Reuters. The spacecraft is designed to fly itself autonomously during landings. The Air Force has two X-37B space planes in its fleet and has been flying them on secret missions since 2010. But the exact purpose of those flights have been shrouded in secrecy. The mission in orbit now, called Orbital Test Vehicle 3 (OTV-3), launched on Dec. 11, 2012 aboard an Atlas 5 rocket. As its name suggests, the OTV-3 mission is the third X-37B flight, but it uses the same space plane that launched on the program's first mission, OTV-1, in April 2010. That first flight lasted 225 days. The second X-37B space plane launched in March 2011 and returned to Earth in June 2012 after 469 days in orbit. The current OTV-3 mission for the X-37B has left the endurance milestones of the earlier missions in the dust. All X-37B missions are overseen by the U.S. Air Force Rapid Capabilities Office. The 3rd Space Experimentation Squadron at Schriever Air Force Base in Colorado Springs, Colorado, serves as mission control. X-37B space planes resemble miniature versions of NASA's space shuttles, just smaller, with two of the vehicles fitting inside the payload bay of a NASA shuttle. Each X-37B spacecraft is about 29 feet (8.8 meters) long and 9.5 feet (2.9 m). They have a wingspan of about 15 feet (4.6 m), and a small payload bay about the size of a pickup truck bed. Boeing's Phantom Works division built the X-37B mini-shuttles. The spacecraft are able to stay in orbit for months by using a solar array to generate power. 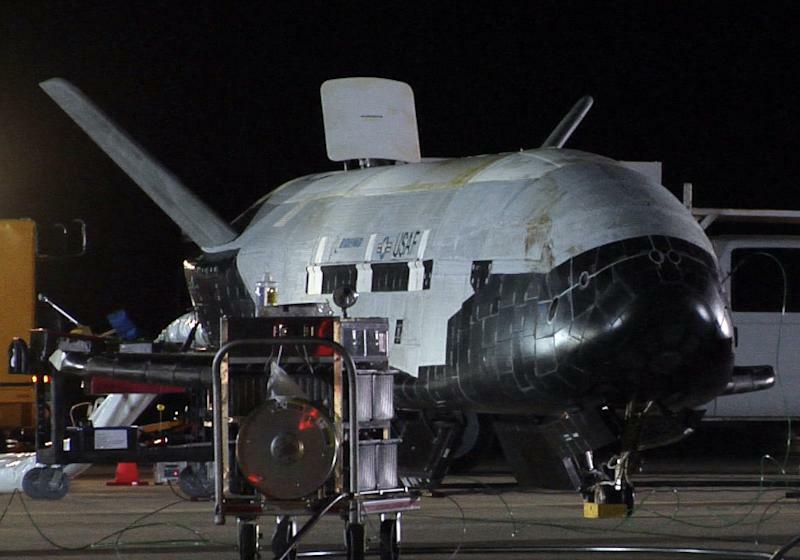 So far, all X-37B missions have landed in California at Vandenberg Air Force Base, but that may not always be the case. Boeing is working to repurpose a retired NASA shuttle hangar at the Kennedy Space Center in Florida, near the Cape Canaveral Air Force Station used to launch all X-37B space missions to date. Meanwhile, the U.S. Air Force has been studying the possibility of using a NASA runway previously used by space shuttles for future X-37B landings.